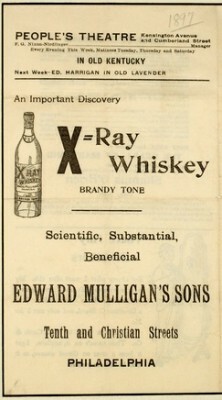 The X-ray’s entertainment value extended far beyond novelty or morbid curiosity about the self. Turning appearances inside out, revealing the image of our death beneath our skin, subverted the visible, known world to the unknown and uncanny. These revelatory powers—merely making solid objects transparent—linked it to the fantastical world of magic and the Occult in the popular imagination. Once again, there was a bifurcation of scientific and aesthetic experience. 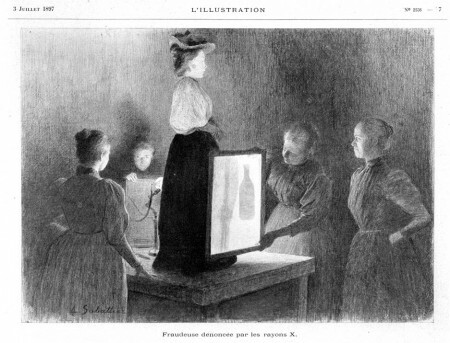 The mysterious nature of both X-ray method and image appealed to (or repulsed) the imagination. Yet its provenance, medical utility, and promise of factual revelation made it an agent of truth. The X-ray and its materiel were used to invent Occult fantasies; irradiated objects would glow in the dark, for example. 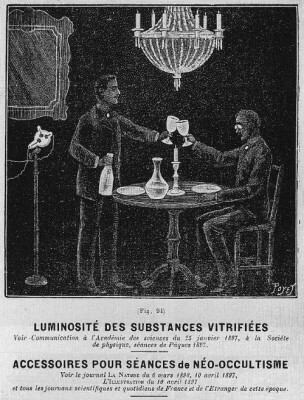 Yet it was also used in the service of science to debunk Occult charlatans, as can be seen in these French illustrations. A fraud is exposed, thanks to a handy fluoroscope and her cooperation. Why she is hiding a bottle beneath her skirts remains unclear. X-ray photography influenced the practice of spirit photography and other attempts to document the unseen, whether thought waves of the living or ectoplasm of the dead. 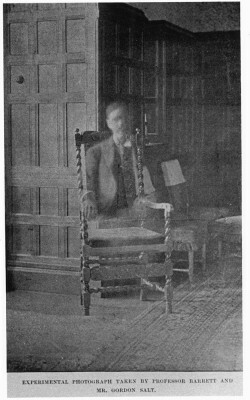 Spirit photography was at this time becoming increasingly popular under the auspices of the Spiritualist Movement, the Theosophical Society, and the like. Both practices shared a discourse around efforts to photograph the invisible; both appeared to reveal an image of death within a living body or context. The Society of Psychical Research, an organization devoted to defending Spiritualist activities through scientific proof, both conducted and investigated spirit photography with the (likely) hope of verifying its accuracy. Among the researchers was William Crookes, a British physicist who improved upon the earliest vacuum tube, and developed the eponymous Crookes tube in 1896. * 25 years earlier, Crookes had become an active, and soon devout, member of the Society (an enthusiasm that nearly led to his disgrace). It was the Crookes tube in Wilhelm Röntgen’s laboratory that first revealed the X-ray. In spite of the ponderous metaphysical associations with X-rays (death, spirits, magic, science, truth), a good portion of their mass appeal owed to their (relative) ubiquity, reproducibility, and abiding novelty. 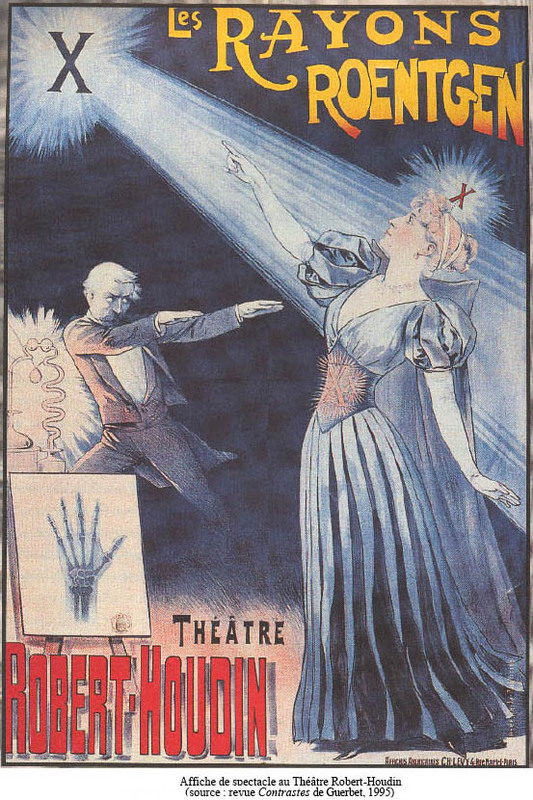 There was a lighter side to the X-ray, and it appealed to the lighter side of the popular imagination. Before radio, middle-class families would often have pianos in their parlors. At least one member sang and played an instrument. 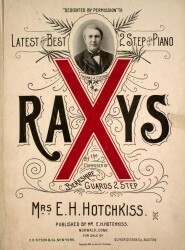 It was common practice for families and friends to gather together and perform the popular tunes of the day, available through widely distributed sheet music, which often included advertisements on the back page. X-rays proved a big seller. Soon manufacturers were associating products of all kinds with X-rays, or harnessing the selling power of Röntgen’s ray to increase business. 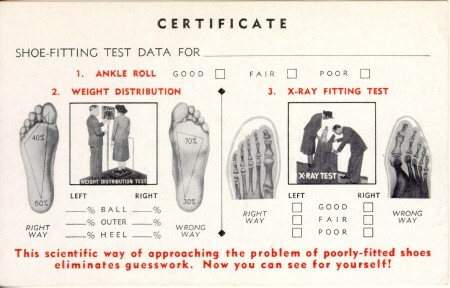 This trend began in the late 19th century and extended through the 1950s, most memorably with resident fluoroscopes drawing customers into shoe stores. Sometimes X-rays connoted legitimacy, precision,clarity. 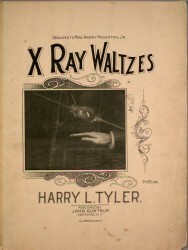 Sometimes X-rays lent an aura of mystery or hidden pleasure. Sometimes the connection remains utterly baffling. 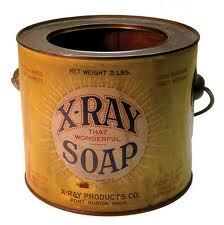 As a commercial fad, the X-ray enjoyed an impressive half-life. *Still in use today as a demonstration tool, as is the Crookes radiometer. “Roentgen,Wilhelm (1845-1923).” Encyclopedia of Nineteenth-Century Photography, John Hannavy, Ed. New York : Routledge/Taylor & Francis Group, 2008. pp 1203-1206.